In June 1917 the Polish Army in France was formed from volunteers and emigrants, and was a separate army fighting by the side of that of France, which paid and supplied them. The men mostly wore the normal French light blue uniform, giving rise to the nickname of the army; the 'Blue Army', which received its other nickname, 'Haller's Army', from its leader, Gen Józef Haller de Hallenburg. They fought alongside the French on the Western Front, and after the armistice were transported to the new Polish state. This 80,000 strong force was absorbed into the fledgling Polish Army, and they soon saw action against both Ukraine and Russia in the following few months. After these victories the Blue Army disappeared, simply becoming a part of the Polish Army. As we have said, whilst serving on the Western Front these men wore mostly standard French uniforms, the one exception being the traditional soft Polish square-topped rogatywka cap. Two thirds of the poses in this set wear this most Polish of headwear, while the others wear the usual French Adrian steel helmet. The officer's version of the rogatywka is peaked while the others are not, which is correct. All have the French double-breasted greatcoat and wear puttees over short boots, and their ammunition belts are the same as worn by their French counterparts. They have the bayonet scabbard and haversack, and some have the rear ammunition pouch, but are otherwise lacking kit such as canteens and gasmask cases, which we find surprising. Once serving in Poland they kept the uniform, kit and weapons, but when the Unified Polish Army uniform regulations were published in November 1919, the Blue Army were gradually resupplied with Polish equipment (such as the M1919 greatcoat, which was single-breasted). However the French uniform was still worn by some until the end of the war with Russia, so these figures are authentic for both the advertised wars mentioned on the box. The officer holds a pistol, and has somewhat unwisely brought a sword, which is hardly a weapon of the 20th century and would help pick him out to the enemy. The men all carry rifles apart from one in the third row, who carries a French Chauchat 'machine rifle'. He seems to be firing it from the hip, which was how this weapon was intended to be used, although this was not easy to do. This man seems to lack the special ammunition pouches that would take magazines for this weapon. All the poses are appropriate for the Great War and the subsequent wars in Eastern Europe, but we were struck by the large number apparently involved in close-quarter fighting. Three in the second row and one in the third all look to be using their bayonet against a close enemy, which is very high for the Western Front but perhaps less so for the Russo-Polish War. 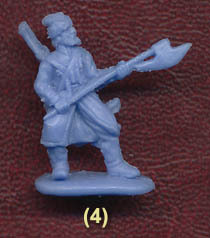 The first man looks to be defending himself against cavalry, which is far more likely in the East than in France. At the end of that row the last man is extending his reach to the maximum, which was not normal bayonet drill, but perhaps still happened. Having noted the preponderance of hand-to-hand poses, all of these poses are reasonable. The quality of production on these figures is up with the current standard for Strelets. The proportions are quite good, as are details. The advancing figure in the second row has a seriously bent rifle not apparent in our photograph, but otherwise there are no peculiarities to draw attention to. There is almost no flash, though a slightly rough feel along the mould line does these figures no favours. With useful poses, good sculpting and no accuracy problems, this is a set that depicts its subject well, and what is more it introduces an aspect of World War I and the following years of which many in the West will not be aware. The poses looking upwards are clearly meant to be placed next to the Red Cavalry sets from Strelets and Orion, although the better quality of these figures does place the earlier Strelets set of Red Army infantry very much in the shade. However that is a risk companies have to take when they improve their quality, and as the result is this very nice set we won't be complaining.